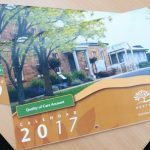 Heathcote Health is proud to release its 2015/16 Quality of Care Account in the form of a calendar for 2017. The calendars have become a regular fixture for the hospital over the past four years and provide valuable health information to the community. Grab your free copy from Heathcote Health Reception today or view the electronic copy here. This month’s Heathcote Health Matters edition focusses on summer preparedness, with above normal fire potential predicted for the Heathcote and district area this year. Click here to read more. Congratulations Vicki Condon on being named the 2015/16 Employee of the Year at last week’s Heathcote Health AGM. The Board of management selected Vicki for the assistance she provided the Aged Care staff when she took it upon herself to engage and calm a resident, who was exhibiting severe dementia behaviours. Vicki went above and beyond her normal duties to work one-on-one with the resident, engaging them in meaningful activities such as washing dishes and helping with the morning tea trolley, all while continuing to complete her own tasks. Through this engagement, positive outcomes were achieved for the resident and the Aged Care team were allowed to respond to the needs of other residents in a timely fashion.